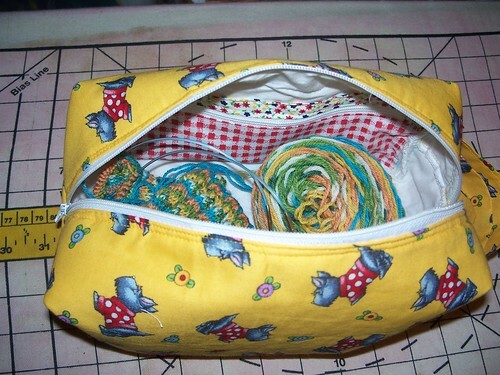 Ok, so someone showed up at knit club with one of these bags, in an adorable sheep fabric. The first thing out of my mouth was how I could make one of those….not only did I say it, but I meant it. I loved that bag. I suppose I could have ordered one, but let’s face it, I like my money a lot and I have a sewing room full of stuff that wants to be used! 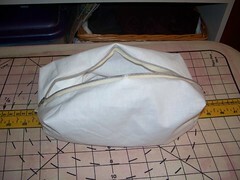 So I hit the sewing room asap, and generated prototype number 1. So attempt one was wonky, but you have to remember I was working off of a 2-3 minute inspection of the bag and some dodgy ideas about how it might be constructed. 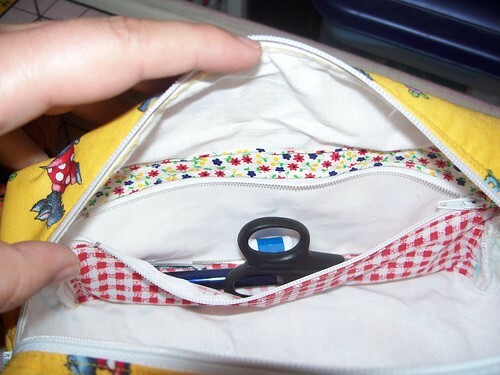 Still cute, tinier than I anticipated, but it will hold a sock in progress. At this point in time I was pretty sure I was going to have to do some math, and for some reason most of the math was hitting me at about 4:00 am this morning. Eventually I gave up, wrote it all down and went back to sleep. I thought I could live with this, but it turns out, I couldn’t. 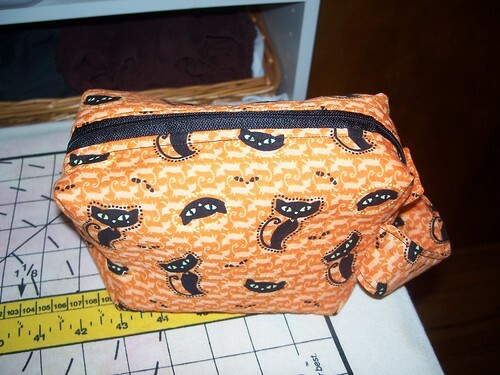 I was compelled to go back to the sewing room… (the new awesome upstairs one that I haven;t told y’all about yet!) There I decided to check my 4:00 am math – because if ANY math needs to be checked it is 4:00 am math – by sewing a cheesy muslin prototype. This bad boy was more a way to check out my thought process and see if I could improve on my prior wonky version. 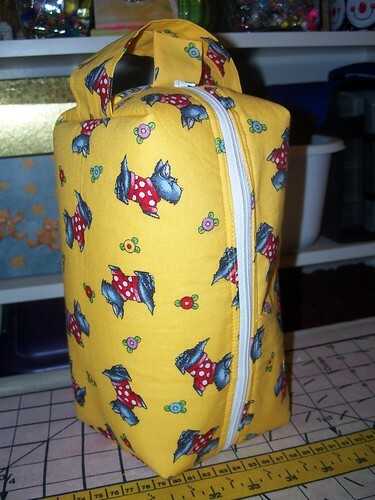 While making this one I got the genius idea to add a zipper pocket to the inside of the final version for notions. It did at least confirm that my 4:00 am math was on track. So, after all that, a final happy bag…. 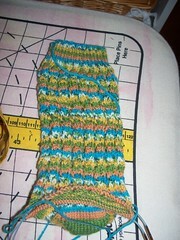 An a sock in progress inside..
Actually I was planning on doing a tutorial…. there are actually three viable ways to construct these things! With one being SIGNIFICANTLY easier on the brain…..